There are two main types of investing: value investing and growth investing. Growth investing is the idea of choosing stocks that you believe will grow over time and therefore have a higher stock price. When the price goes up due to growth, you make more money. Value investing is very different. You are still looking for stocks that will have a higher price in the future to make money, but not based on growth. 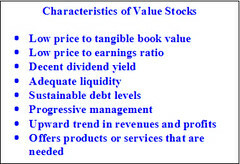 Value investors believe that some stocks are priced below or above the true value. If you believe a stock selling for $10 per share is actually worth $12 a share, you also believe it will eventually go up to $12. Buy it before it goes to $12, and when it reaches that, you will make money. Should you Use Value Investing? There are many successful investors that use value investing. Warren Buffett is one of the most famous investors who has made millions using this technique. If you want to mimic their success, learning value investing techniques, practicing them, and using them in the real markets will make you money. First, you need to understand that value investing has everything to do with the corporation behind a stock and not the stock itself. It doesn't matter what trends have happened to a particular stock in the past. You need to understand the company itself. This also means that value investing takes a lot of research. Fortunately, you should be able to be successful and make a lot of money for the work you put into it. Think of the time you spend researching companies as the work you put into making a lot of money. If you do well, your pay per hour will still be far more than a regular job, in many cases. The more you invest, the more it will be true. Not only is research important, but having a strategy is important, too. Figure out how you will be deciding which investments to invest in. How will each company need to measure up? Will you decide based on price-to-earnings ratios, price-to-cash flows ratios, etc.? Pick a strategy and then continue to find the best investment based on your criteria. Search through all the investments you can to find the ones that beat them all. Invest in multiple companies to stay diversified, but never stop looking for the winning investment. If you are still unsure if you want to use value investing or you want to learn more, learn from the masters. Ben Graham and Warrant Buffett are two incredibly successful investors that used this method. Learn what they have to say and use what you learn. Of course, these aren't the only successful investors out there. There are many great books written on the subject. If you want to do well in investing, no matter what strategy you use, practice before you commit. Use a stock market simulation game to practice buying and selling stocks in the real stock market before you risk your own money. You can research and trade as you normally would, but you don't have to lose any money. If you want to be a successful investor, you need to have the right knowledge and experience. Do you want to practice and learn more about investing in stocks for free? You can sign up for a stock investing game and also have the chance to win free cash prizes and gift cards. Get the knowledge and experience you need for free.